In his steelheading video, Jim covers steelhead fishing with his sinking fly lines from line rigging to fighting the fish. 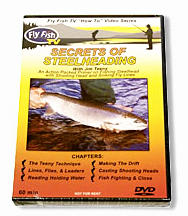 It includes covering and working the water, tips on fly selection, line control, and includes very informative sections on casting and handling sink tip lines. All of which can be applied to salmon fishing.